Recent research has shown that nearly 40% of 7 to 18 year old baseball players endure elbow and shoulder pain during their baseball season. Nearly half of these injured players report their ongoing participation despite having pain. A recent epidemiological study of ulnar collateral ligament (UCL) injuries in athletes 17 to 20 years old reported the number of UCL reconstructions has increased dramatically for this age group. 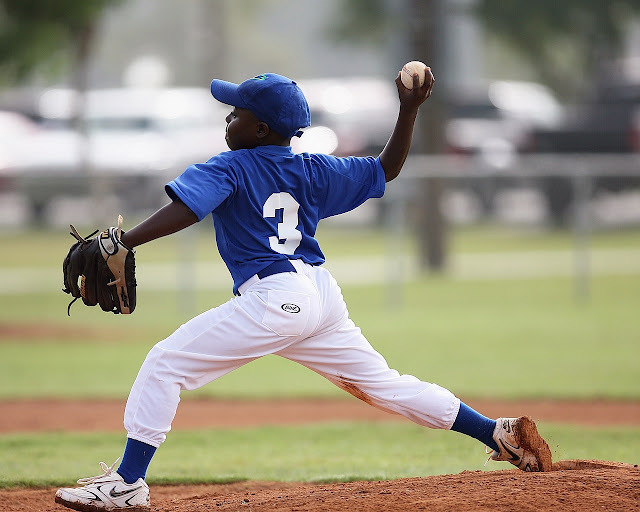 Early education and detection of elbow injuries in throwing sports may help reduce the number of overuse injuries from developing. “Little league elbow,” or known as medial epicondyle apophysitis, is most commonly found in young throwers. Sports such as baseball, softball, tennis, or golf, can result in this overuse injury to the growth plate on the inside of the elbow. Repeated stress to the growth plates may cause inflammation and lead to pain or swelling. Serious injury may even result in separation of the growth plate from the rest of the bone. Players may also experience a reduced range of motion and a decreased ability to throw hard or far. A child experiencing any symptoms involving their arm should cease activity and see a pediatric specialist or their family physician. X-rays may be required to determine the extent of damage. Prevention begins with identifying causative factors early in the season and adhering to strict guidelines such as the pitch count for young players and the duration of participation in a given year. Total body conditioning that involves strengthening the hip, back, and legs may help reduce the strain on the athlete’s arms. 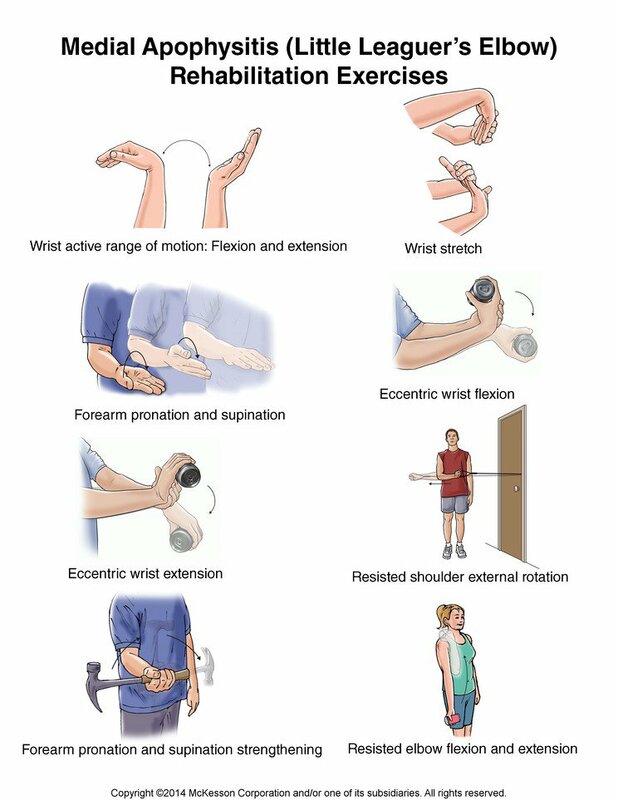 See below for exercises on how to stretch and strengthen the forearm. Playing in a variety of sports rather than engaging in one particular sport, known as early sports specialization, may promote athletic dexterity and minimize risk of overuse injury. Partial UCL ruptures can be successfully treated with nonsurgical treatment. However, with or without surgery, players must cease any throwing activity prior to undergoing an organized throwing rehabilitation protocol to reduce the risk of further progressing the injury. Promoting mental health is also important in the young athlete’s recovery period. Preventing the athlete from participating in their sport may result in significant psychosocial trauma. Therefore, special attention to the athlete and feelings of sadness or depression should be addressed with coping strategies.